The movie award season may now be a distant memory, but now it's Television's turn to award it's best and brightest as the 2015 Primetime Emmy Award nominations are out. The nominees for Outstanding Animated Program are an interesting mix this year. While The Simpsons and South Park get their usual nods so do, the more recent adult animation additions Archer and Bob's Burgers- coincidentally both starring H Jon Benjamin. The final addition to the category is arguably the most interesting, however. 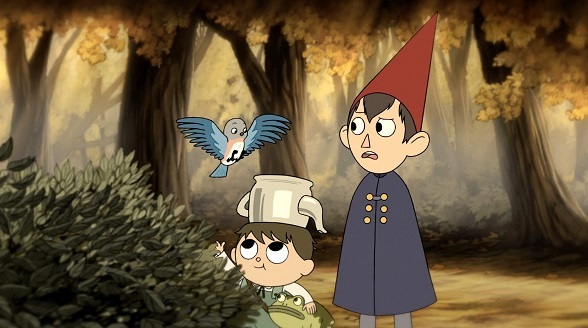 Cartoon Network's acclaimed limited series Over The Garden Wall stands out among the competition. As the category is dominated by well-established adult animated sitcoms, it's quite an achievement for this family-friendly series to make the cut. Cartoon Network/ Adult Swim has also done well in the Short Form animated category: Adventure Time, Regular Show, Steven Universe and Robot Chicken all scored nominations, while Disney got recognition for Wander Over Yonder and the Mickey Mouse shorts. In the voice performance category, it was mostly a case of business as usual as Dan Castanella and Hank Azaria were recognised for The Simpsons, Seths MacFarlane and Green were nominated for Family Guy and Robot Chicken respectively, while Bob's Burgers was represented by John Roberts. Lastly, legendary voice-actor Tress MacNeille finally scored her first nomination for one of her many turns on The Simpsons. The Simpsons did score one other nomination for which it was eligible- for sound mixing- but much as with the film awards, animation continues to be ghettoised and shut out for other nominations. After all, it's only cartoons right guys? Not like real television. The 67th Emmy Awards will take place on September 20th 2015.